A powerful database viewer and editor that allows home and business users to access databases directly using the familiar Windows interface. No programming skills needed! This small and handy utility offers everything you need for working with databases. Unlike other similar tools, CDBF doesn't separate viewing and editing modes: when you are viewing the table, you can simply click on the field you want to modify and make any necessary changes. 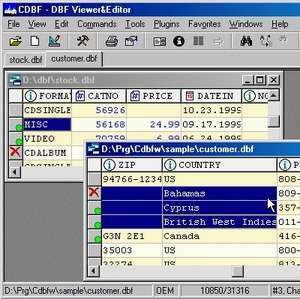 CDBF - DBF Viewer and Editor 2.45 is a shareware program and can be used as a demo to try the software until the free trial period has ended. A full version of the program is available after the trial period ends. For security reasons, you should also check out the CDBF - DBF Viewer and Editor download at LO4D.com which includes virus and malware tests. Additional screenshots of this application download may be available, too. CDBF - DBF Viewer and Editor has a presence on social networks.